1. University of St. Louis announced that they will accept students who have Trinity College ISE and IELA University entrance pathway courses. It will not be suitable for students who directly enroll to school. And from next spring, the academic English in school will become grade 4 instead of grade 6; grade 5 instead of grade 7. 2. Oregon State University declared that the school will have some change on some documents for the change of SEVP(Student and Exchange Visitor Program) in US. First Study has good news to announce! For students who are is going to enroll in the spring and summer of 2018, we will provide you scholarship up to 12 thousand USD, which is about 360 thousand NTD! If you are going to enroll in this timeline, please seize this chance and send us the application. Drew University announced that if students who enrolls in autumn 2018, their tuition shall reduce 20%; from the 48,336 USD to 36,500 USD. In addition, Taiwanese Pathway students can still receive 5,000 USD scholarship. Therefore, the tuition will even be reduced into 34,500 USD. If you interested and you need more information, please contact First Study! Recently, we have new announcement of application and courses from schools in UK and US! 1. Suffolk University declares that the graduate school formed by MS Business Analytics, MS Marketing, MS Finance, and MS Financial Services and Banking will become the so-called "STEM course." 2. Washington State University stated that they will provide international students a discount that they do not need to pay deposit when applying their college or graduate school. 3. Saint Louis University stated that they have cancelled MS in Sustainability and the program's graduate pathway course. If you are interested or you need more information, you are welcomed to contact First Study! First Study is going to tell you a great news! If you are still looking for enrollment in September, the application is still available as long as you can receive the visa. Also, we still have room available for students to move in. The school enrollment opens between September 25th to October 2nd and freshmen students will gradually check in. If you haven't arrived last week, please remember to check in once you are arrived. New Announcement about tuition discount! First Study is pleased to announce that those who attend at least 3 times of degree or academic English course between September 25th to November 11th and are ready to enroll before 2018 January can have a 1000 GBP discount! As long as you write on "QDD-Jan18" on your accept letter, you shall have this discount! If you are interested or you want to have more information, feel free to contact First Study! First Study has a new cooperate school!!! Bristol Academy is a state-of-the-art English language centre that is registered and recognized by the Ministry of Education, Malaysia to provide English language education. Established by a team of professionals with a cumulative experience of over 25 years in the field of education, English language, professional training and development, we cater to a wide range of learners of different age groups and various interests, including young learners, adults, students pursuing their higher education as well as working professionals and organizations. If you want to see complete information, please check our website. In order to thank you for your loyalty and encourage you to study French in France, we are pleased to offer you 10% discount!!! We wish you a nice and colourful Fall ! The Language Academy(TLA) has updated the newest date and price list in 2018. The Language Academy is a leading English School for International students and business executives. Personal attention and quality teaching are their top priorities. Eurocentres is glad to announce that the latest news and price list in 2018 is released! The new price of 2018 will be started from November 1, 2017. Student who is registered by October 31, 2017 but enrolled in 2018 will still be accepted the old price of 2017. We are proud to say our Graduate Preparation Programme students in the UK will be starting some very interesting degrees in pretty exciting universities this Autumn. 20% of our Graduate Preparation students have offers from the top 5 universities in the UK. Our Graduate Preparation Programme is delivered at Kings Oxford and depending on their level of English, students can take it for 1 to 3 terms. Specifically designed to ensure students are fully prepared for the rigours of a UK Masters' degree (beyond just the IELTS score! ), the course offers a combination of intensive English, academic writing, presentation skills and IELTS preparation and is complemented by one-to-one university application guidance from our expert university counsellors. We ensure each student applies to the best universities for the degree subject they want to pursue. We still have places on the term starting 11th September 2017 (late arrival permitted up to 2 weeks) or your students might be interested in starting in January or April 2018. It is very pleased to present our Special Offer, which will be valid for bookings received before 11th December 2017! You will notice that this special offer includes even more generous discounts on certain courses at St Giles Eastbourne! These are valid for bookings at our year-round centres in the UK, USA and Canada received by 11th December 2017. If you are a Chinese and you hope you can speak English all the time, then Eurocentres is your best choice! Located in Cambridge, the school's learning environment basically can guarantee your English will be improved. Because the students in our school mostly are from Japan, Korea, or Middle/South America, you have to speak English no matter how bad your English is. There has no chance for you to speak chinese. About the learning, the teachers are very patient and they have great personality. 90% of the teachers are British, so basically you can learn such an authentic british accent. Eurocentres also provides great equipment. Eurocentres provide multi-media centre, study room, and the library so that you can study yourself autonomously. The food is also very cheap and you will be very full. It is a school full of consideration. 【St. Giles】has new school in Cambridge! We have recently acquired the New School of English, which has been providing high quality English courses since 1962. We'll be working throughout the rest of the year to refurbish and rebrand it so that we can relaunch it as St Giles Cambridge in early 2018! St Giles Cambridge will be a mid-sized school with space for up to 170 students aged 16 and over. It's based in a large, traditional building within walking distance of the city centre. With 12 modern, well-equipped classrooms, we'll be offering the same wide range of courses you can expect from all of our schools. You'll also find the same range of additional services - plenty of accommodation options, transfers, a social programme, insurance and so on. Like we said, St Giles Cambridge will be launching in early 2018. Until then, we'll be managing the school and offering courses under the New School of English brand. To encourage you to book these courses, we're offering our partners an exclusive discount: 30% off the tuition fees for any course! You can find the 2017 prices on the school's website. 2018 prices will be in the final version of our CDP, which will be with you in the next couple of weeks. Duolingo institute has adjusted the score by comparing TOFEL/IELTS. In order to face the adjustment, American Honors/American Success has adjusted Duolingo's entrance grade in 2018. But don't worry! This adjustment will not affect the AH/AS students enrolled in 2017. If you are going to take the Duolingo test to apply for the 2018 American Honors or American Success, please take a look at the new file and new grade request. In the future, we will also update the newest 2018 course introduction brochure. BROWNS is glad to announce that the course schedule and price list in 2018 is released! Anyone who successfully got the application before September 29th in 2017, no matter when you start and end your course, BROWNS will consider your price according to the 2017 non-tuition fee. If you got the application after these dates, we will charge the non-tuition price according to the 2018 course schedule. A few days ago, English Language Center(ELC) has updated the newest date and price list in 2018. In the course part, ELC has kept almost the same context. 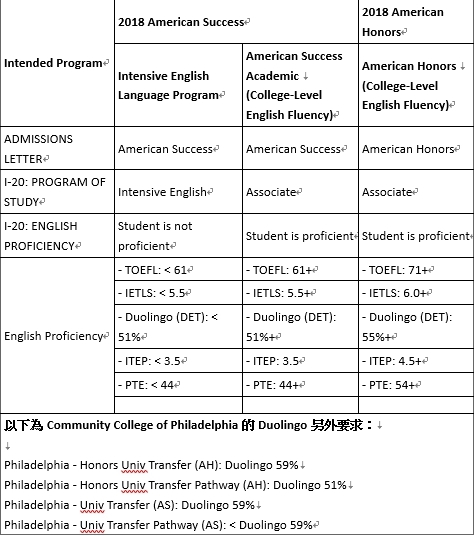 English Language Center already has 3 schools in the US and all of them have years of experience. Not only do they provide language schools but also provide teenager program and winter/summer school! Last week, First Study has had new cooperation with Pacific Lutheran University and University of California Santa Cruz. Pacific Lutheran University (PLU) is a integrated private university located in the Washington state. It has included nursing, education, calculation, and so on. PLU has a huge campus that it is about 90 football field big. The school is very close the city center and the Seattle international airport, so it has always been a great choice for students to study. 	The Princeton Review- One of the best business school among 295 schools. University of California Santa Cruz(UCSC) is a public school, located in the US Silicon Valley. It is famous for its practical programs. The school is founded in 1965. Its modern school building and innovative teaching has attracted many local students to apply. In fact, UCSC’s unique geographic location has brought many advantages for students to learn and have internship. In the Silicon Valley, the high-tech companies located in the Silicon Valley will provide opportunities for students have a one-year internship. When international students graduate, students even have a chance to earn a work permit to stay in the US to work. 	The Princeton Review-One of the most environmental friendly school in the US. 	Times Higher Education World University Rankings-No.2 highest with Stanford University. Congratulations to those children chosen to go to final! The final of the English speech contest "I am big, I can see the world" will be held in Taipei on July 8. One of the judges of the contest is Lavinia Yang, the Executive Director of First Study. She is so proud of those little speakers for expressing their idea. We really should educate and cultivate our children since they are young. And going to other countries, participating camps are good ways to do so. Effective June 1, 2017, Cal State Apply will replace CSUMentor as the new CSU application for admission. Transition from CSU Mentor to Cal State Apply-new! Those who wish to apply to both undergraduate and post-baccalaureate programs for Fall 2017 are encouraged to complete their application by May 31st through CSU Mentor. Applications are considered completed when the applicant has: (1) completely filled out the application. (2) paid the $55 application fee, and (3) clicked submit. Incomplete applications cannot be processed. CSU Mentor will close at midnight, May 31st, 2017, and will be replaced by Cal State Apply. Cal State Apply will accept applications for winter 2018. Riviera French Institution in Cannes‘ Sptlights ! The official opening of the International Film Festival in Cannes! Riviera French Institute offers various French language courses including summer courses. Please click the link and see the detail. Let's study French in Cannes witness Hollywood movie stars! Alpadia Language Schools with many certificates provides summer courses and other language programs. SLUWE (Saint Louis University Writing Exam) and TOEFL (PBT) have been removed from ALL undergraduate and graduate Pathway entry and progression requirements. NOTE: The TOEFL / SLUWE will be used as placement tests to determine the appropriate courses for each student only. Transcript and minimum GPA no longer required for Academic English only applicants. Applicants will only need to submit a diploma. Effective immediately, the fees for housing and meals for the INTO Drew University Pathway and Academic English programs have been reduced. We now are able to exclude housing and meal costs during the long holiday/New Year university break for students who prefer to leave the residence halls to travel home or elsewhere during the holidays. Students will be able to leave their belongings in their rooms during the break at no additional cost. Students who intend to stay in Drew housing during the scheduled closure will be able to, and associated fees for housing and meals will apply. Note that housing and meals for students staying on campus during the holiday/New Year break will be approximately $1,850. Final pricing is determined by Drew University. The reduced prices will be reflected on all statements and offer letters going forward for Fall 2017. Outstanding offers (including confirmed offers) will have this rate applied retroactively and updated statements will be issued in the next week. The new housing rate will be applied to existing Pathway students beginning in Fall 2017. INTOstudy.com pricing has been updated, and please find updated brochures by visiting folder or check the attachments. March/April – Two-Term Pathway Programme start dates at 5 different INTO centres. Perfect for those last minute students! INTO Colorado State University: Program Updates, $4,000 Post-Pathway Progression Scholarships, Mid-semester Academic English intakes, and Graduate Pathway changes. IUG is awarding Scholarships to students with outstanding academic results who wish to enter our Bachelor programs during the Academic Year 2017-18. Please find attached the document with all details and conditions. 【Plymouth University and the International University in Geneva】Dual Degree is now open! INTO CSU will offer two new mid-semester intakes for Foundations of English Language in the spring and summer semesters. These shorter sessions are designed to give students an earlier start in their planned Pathway or Academic English program. Successful students may be able to progress directly to their Pathway program. Effective immediately, the Graduate Pathway program leading to a Master of Agriculture degree is no longer accepting new applications. Students interested in Agriculture, should be referred to our Master of Agriculture in Agricultural Extension Education Graduate Pathway program as an alternative option. Students already in the Pathway or degree program, or who have applied, been admitted or confirmed for this Pathway program, will NOT be affected by this change. Grade progression requirements for the Civil Engineering Graduate Pathway programs for the CIVE courses have been reduced from a B to B-, if students earn a cumulative 3.0 GPA in all CIVE course. Please visit link for full program details. Please note that INTO OSU will no longer offer General English (GE) courses after summer term 2017. Application material have been updated and June 2017 is the last available start term for General English applicants. NOTE: Short-term English programs are still available upon request for special groups. Please contact center to discuss arrangements. 【Ireland】Announces 24 Month Stay Back Option! The Irish Government has agreed to extend the Third Level Graduate Scheme, for non-EU/EEA students at level 9 and above of the National Framework of Qualifications. The new permission will double the ‘stay back option’ for masters and PhD students from 12 months to 24 months. This will allow eligible graduates who have studied in Irish higher education institutions and whose award is granted by a recognised Irish awarding body at Masters or PhD level to remain in Ireland for two years to seek employment. 【St. Giles】FIVE New option for St. Giles Juniors centers! New Year, new campus! St Giles provides you 5 option of Junior courses! This year, there are FIVE more campus: LA, New York, Boston, Bournemouth in UK and also Family Course in New York! In addition, you can also have explorer tour with your family! Tell this news to your bro, sis, and parents! Join St Giles with your family! Offer you various options! Contact First Study to know more! Our partner school, The Language Gallery, is coming to Berlin this year! Now you may choose to study at Hannover or Berlin in Germany! New option, new experience! You could explore the city with Berlin Bear, Memorial to Murdered Jews in Europe, Berlin Wall, cathedral etc. Don't miss the chance to have historical journey! Find Program Service in our website to get more information! 【University of The Pacific】Apply for 2017!! With immediate effect, the Pacific University undergraduate freshman international freshmen began to accept the 2017 application. University of the Pacific is a well-known private comprehensive university, founded in 1851, is the United States of America California earliest recognized university license. Application requirements: GPA 2.7-3.0 to be GMAT or GRE results, note that all applications need to submit Cover Letter. Business School: Accounting, Business Analysis, Human Resources, MBA, Marketing, Information Management, Applied Economics. The Canadian government has quietly introduced an important change to how it processes visas for students entering Canada to pursue conditional admissions or pathway programmes. Under the new processing policy, visa officers are instructed to issue a study permit – that is, a Canadian study visa – only for the period of the student’s preparatory studies. This is a departure from the previous practice which saw visa officers issue a single study permit for the entire duration of both the student’s prerequisite and academic studies.